Dave is Principal of Civitas Advisors and a frequent contributor to the Commercial District Advisor. In this piece, originally published in Crain’s Detroit Business (“Afternoon riverfront walk reveals ‘new’ downtown, opportunity, Crain’s Detroit, 10/20/14), he talks about his early years working in Detroit, and the astounding changes the downtown as seen since then. Enjoy! In early 1994, after directing Kalamazoo’s downtown organization for five years, I was offered the opportunity to return to my hometown of Minneapolis, where I was expecting to lead the city’s community development agency. However, newly elected Detroit Mayor Dennis Archer called with a pitch I found too enticing to pass up. I was soon working for Detroit Renaissance as executive director of downtown and community development, and wondering exactly where to start. Downtown Detroit was on life support. More than a quarter of the commercial buildings were totally vacant, another quarter was less than 50 percent occupied. That left half the commercial real estate economically nonfunctional. Some retail stores (and there were few) were heated with kerosene space heaters. Even the better restaurants were not that good, and one, located near Harmonie Park, refused to put a sign on the exterior and kept the door locked. You had to knock to get in. Woodward Avenue was 10 lanes of potholes with little traffic. Pedestrian traffic was virtually nil, even at lunchtime. The Hudson’s building loomed like a foreboding castle, stripped by scrappers and open to anyone who might have the courage to wander into its abyss. Islands of activity existed — City Hall, the Renaissance Center and Greektown — but they were exceptions. Detroit’s neighborhoods were also facing massive challenges. Some community organizations, especially the Warren-Conner Development Coalition and the Southwest Detroit Business Association, struggled to overcome a tsunami of negative media coverage and failing city services, but most neighborhoods had simply lost the struggle and returned to prairie grass. Working with the CEO of Detroit Renaissance and city officials, I was assigned three priorities: Figure out a plan for the Hudson’s building, create a new “greater downtown” organization, and provide support to community development corporations in the neighborhoods. Working closely with Bob Larson, CEO of the Taubman Cos., and Jim Tervo, Mayor Archer’s top development adviser, we hatched a plan to acquire the Hudson’s building and much of the surrounding real estate, eventually totaling about 16 acres. With commitments of $2 million from local corporations and help from the Honigman law firm and Vigliotti Realty, we secured options and purchase agreements on about 80 percent of the buildings within our target area in less than a year. Those options were transferred to the city of Detroit once the project became public, and today Compuware, Quicken Loans and many other companies occupy the site. 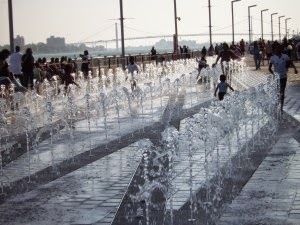 Rather than attempt a merger of the four downtown organizations that existed at that time, we elected to create the Downtown Detroit Partnership with a focus on the central business district but allied with and supporting the other groups along the riverfront and up into Midtown and New Center. I left Detroit in 1996 to become president of the newly created Downtown Partnership in Des Moines, Iowa, a move precipitated by the death of my father in Minneapolis and the failing health of my mother. My return trips to Detroit were infrequent, most recently a few years ago to visit with Dave Blaskiewicz, who was then president of the DDP and pointed out some of the noticeable public space improvements. Still, nothing quite prepared me for the change I experienced when I returned for the Detroit Homecoming event. It was, in a word, stunning. Once I checked in at the Westin Book Cadillac — an unbelievable transformation, and one I thought I would never see — I strolled down through Hart Plaza to see the riverfront walkway. There I met a middle-aged couple, tourists from Frankfurt. German tourists? Further along the “international riverfront,” as it’s called, I encountered another group of tourists, this time from Sweden. I walked around the Renaissance Center, where my office used to be, and into Greektown; I paused for a brief conversation with a young couple from Spain. Diversity was taking on a whole new meaning in Detroit. My afternoon walk lasted about three hours. Sidewalks were clean. Planters were filled with colorful flowers and decorative plants. Bikes were nearly everywhere. Despite what appeared to be a slew of apartment and condo conversions, I was told that the vacancy rate for downtown units was approaching 1 percent, and waiting lists were as long as 18 months for good apartments. Coffeehouses and appealing restaurants seemed to beckon the much-increased pedestrian traffic. Lunch in Eastern Market with Dan Carmody confirmed what I had been reading: Eastern Market is arguably the premier market of its kind in the country. Carmody has gained a reputation as a visionary when it comes to connecting food, public health and community development. But what of the neighborhoods beyond downtown? While housing initiatives are to be applauded, and while urban gardens and green space will offer some respite from painfully empty blocks, a real opportunity may be present along Detroit’s commercial corridors. Most cities have figured out how to revitalize downtown, but neighborhoods will not return to health until progress is also made in terms of bringing back commercial corridors such as Gratiot and Grand River. Cities such as Pittsburgh and Washington, D.C., are evolving new and creative strategies for bringing these business streets back to life, and Detroit might learn from them. No one wants to buy a home in a neighborhood where the local Main Street is abandoned and scary-looking. One piece of concrete advice for Detroit: Find neighborhoods where there is still some good housing stock and social fabric, then concentrate on just a couple blocks of commercial storefronts at first. Work to build an alliance between business and property owners and neighborhood residents. Try to find locally owned businesses, not Walgreens and Subways. The chain stores will come later, but build a unique set of shops if you can. And create a local organization that can do the three M’s: manage, market and maintain. As I departed Detroit for a few days in the Upper Peninsula, I had to appreciate that with all of the actors, big and small, engaged in reviving Detroit, a corner had been turned. The clouds have broken, and once again, the sun is shining on Detroit.